The Grip of Terror is Upon Your World! Nephandum contains the d20 system rules and narrative elements to integrate in any fantasy setting a new horror campaign that works at three different stages: investigative, epic and apocalyptic. The cosmos of Nephandum deviously creeps into your campiagn, turning it into a wide-eyed nightmare. Only the bravest and most cunning adventurers will survive! 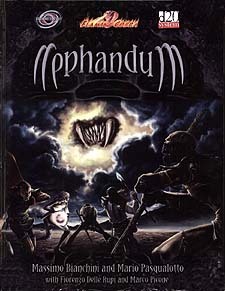 Nephandum features new horror-related prestige classes, feats and spells, as well as innovative gaming techniques to introduce the influence of ancestral entities bent on engulfing the Material Plane.